Learn how to format social security numbers in Excel spreadsheets by adding the appropriate dashes in the numbers to make them easier to read. When importing data such as social security numbers, they may come in without dashes, making them harder to read. This also may prevent you from easily extracting just the last 4 digits of each number. 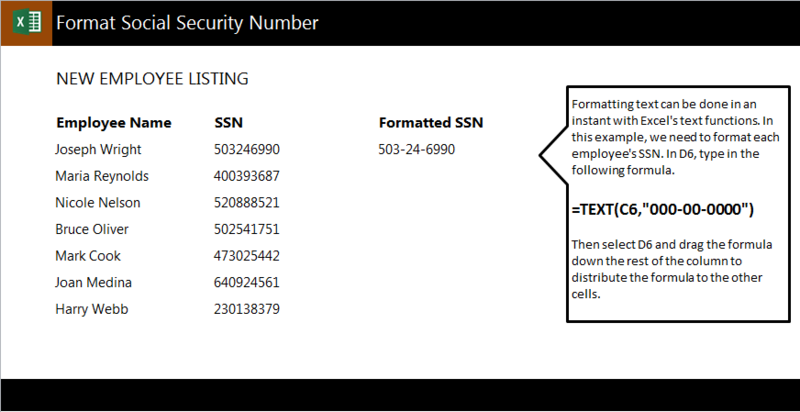 With our example sheet, you can learn how to easily format social security numbers to contain dashes. Download the example spreadsheet to learn this formula. In your example sheet, you have a list of employee names and their social security numbers without dashes. The goal is to add the normal dashes to the numbers in column D.
After hitting enter, it will show the number as 400-39-3687. To apply this formula to the rest of the numbers, drag the cell D6 down to D12 and it will automatically add the dashes to each social security number so you don’t have to retype the formula. When you are using this formula in your own spreadsheet, change the “C6” in the formula to the cell that contains the unaltered social number. This tells Excel where to pull the data from. Many thanks for all the worksheets and training – so much helpful..